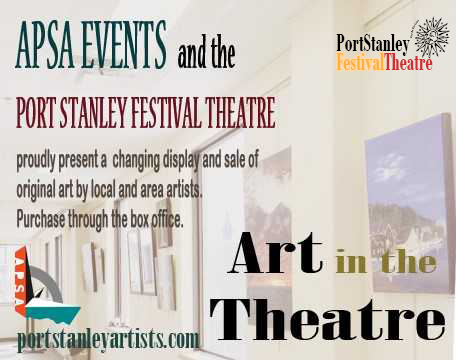 The Port Stanley Festival Theatre is located in the quaint historic fishing village beside the lift bridge which has been in operation since 1939. Port Stanley offers visitors many things to see and do whether you are vacationing or day-tripping. The Port Stanley Festival Theatre is a professional live theatre that shines a light on Canadian talent. Offering both matinee and evening performances in an accessible, air conditioned historic town hall. The Theatre offers beautiful lake views to enjoy over intermission and a cash bar. Port Stanley has a thriving art community and amazing galleries for one of a kind art pieces. Some of these pieces of art are displayed in the hallway leading into the Dorothy Faye Palmer Room at the theatre. The art changes constantly and the works are for sale. The Association of Port Stanley Artists (APSA) oversees these art exhibits.